I had the pleasure of interviewing Sally Grimes. Sally is group president of prepared foods at Tyson Foods. Throughout her career, Sally has spearheaded the growth of dozens of iconic brands from Kraft Macaroni & Cheese to Sharpie to Jimmy Dean. At Tyson Foods, the largest food company in America, Sally leads the prepared foods segment, which on its own would be among the top 10 largest consumer food companies today. 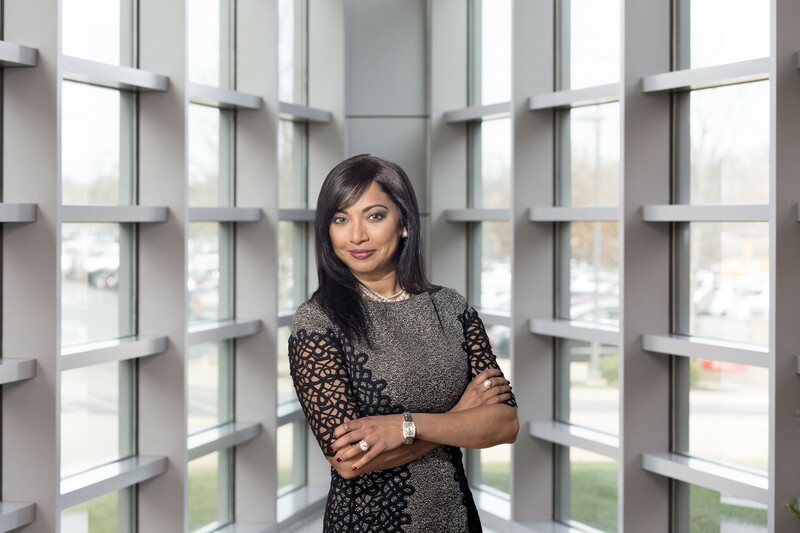 She has constantly proven that big and nimble are not mutually exclusive; she is the creator and champion of the Tyson Foods Innovation Lab and is known for her unwavering growth mindset and track record. I get to wear many hats. 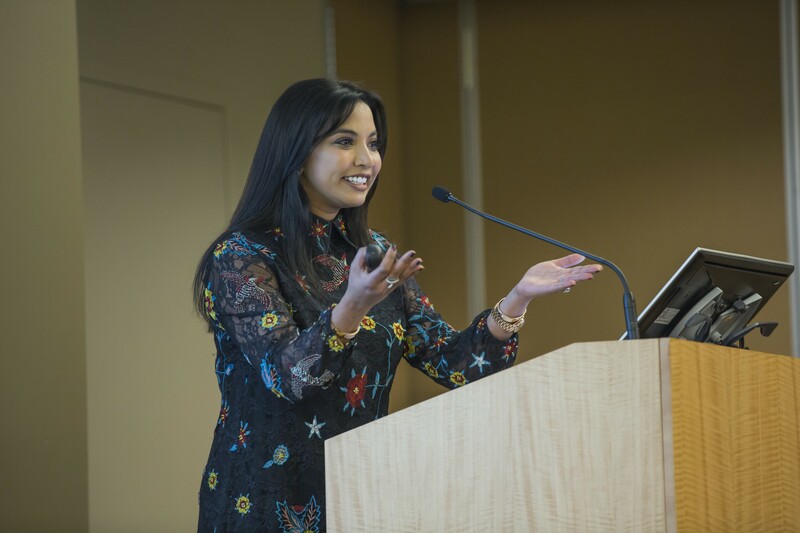 Mother, wife, leader, innovator… But it all started by being the daughter of immigrants who came to America for their education and ended up together through an arranged marriage. What does that have to do with my approach to leadership? My parents sought out opportunities and were not afraid to do something bold to go after it. And they taught me about the importance of relationships of all kinds, and that they require work. I believe leadership is fundamentally about people and relationships. It’s where my story starts and is what it’s about today. My “first job” was in fifth grade when I went door to door convincing friends and neighbors to buy my handmade greeting cards. I had a passion for the creative arts, yet my parents steered me in the direction of a more “stable” career path in finance, followed by an MBA from the University of Chicago. But my yearning for a creative outlet continued, and I soon discovered that my foundation of financial and business discipline — together with creative applications in consumer insight & marketing — delivered successful innovation. I found my sweet spot in the art & science of business. I’ve had some cool opportunities to work with teams to reimagine large category leading brands — from the first microwavable macaroni & cheese 20 years ago to transforming Sharpies from a utilitarian labeling tool to a community of creativity. Now, at Tyson Foods, the opportunities are endless. We’re embracing the responsibility of our scale and reimagining the notion that quality food is not accessible to all, like transforming Tyson chicken to “No Antibiotics Ever.” I’m proud to be part of the leadership team that is transforming Tyson Foods into a modern food company to meet the demands of the world’s growing population today and tomorrow. The story that led to my current position is rather interesting for me. I was part of the leadership team of Hillshire Brands Company, the ~$4B spin-off of the Sara Lee Corporation, with an aspiration to create a very different kind of food company — entrepreneurial, agile and innovative. After the ~$40B Tyson Foods acquired us just two years later, I scheduled a 20 minute meeting with my new boss, the CEO, to explain I’d be moving on. After all, how could I be “entrepreneurial” at such a large company. Two hours later, I was surprised to find myself ready to change the world by bringing sustainability, transparency and creativity to food — at a scale that really matters and few can achieve. Big food has the potential to do tremendous good, and I was ready to be part of the change. The food industry is more dynamic than ever before as consumers’ expectations change — what they value in food and how it fits into their lives is evolving — and even where and how they purchase and consume food is changing. While others have struggled to keep their footing, Tyson Foods’ growth stands out. We’re sharply focused on protein and the demand for protein continues. And we know that to meet the future demand of a growing population, we must innovate beyond products — and innovate at the food system level. Many large food companies are avoiding conversations about the environment, animal well-being and food quality. We’re embracing them, and even leading the change for our industry, because we know that solving for the need of sustainable food at scale requires big thinking and bold actions. Who better to do that than the largest U.S. food company? From that perspective, big is an advantage — but lots of other things that usually come with big aren’t — like bureaucracy. We are very focused on getting better at agility and flexibility so we can move faster. It’s hard to solve new problems using the same old tools; we’ve trained our teams in design thinking, for example, and use design sprints to tackle problems in a new way. One example is a game-show style competition we created similar to “Shark Tank,” which challenges teams over the course of an afternoon to develop and pitch a new product idea. It’s been so inspiring to see ideas from all areas of our company. So many! Do I have to choose just one? This year we kicked off Tyson Innovation Lab, which is very different from the innovation incubators others implementing. At its core is the priority of speed — and the ground rule that whatever problems our Innovation Lab tackles, it must be solved in six months. To enable this, we designed the team for agility — it is a flat, cross functional team that has been trained to operate differently. And they make me operate differently too. When I walk into the Lab, I know I will be asked to make decisions on the spot — choose a product name from three finalists or to pick our first flavors. And to make it even more interesting, the Lab’s primary mission is to help us imagine the future of food, and to deliver on our mission of raising the world’s expectations about how much good food can do. So, we want to meet a market need for consumers, but we also want to solve bigger problems. The Lab’s first innovation, Yappah! Protein Crisp, which launched in May, is focused on addressing food waste. Crafted from rescued vegetables and spent grains, as well as Tyson chicken, the Yappah! product not only places us in a new section of the snacking aisle, but it signals a new way forward for the company. It’s exciting to see how this commitment is leading to new ways of ideation that address critical issues in the food industry. Leadership transparency. So often leaders work to craft an image of perfection — they don’t want to let their teams see them make a mistake or acknowledge a shortcoming. I haven’t found that to be sustainable leadership model — if you want your team to be bold, they can’t be afraid to fail. So, I believe that first and foremost we must model the behavior we want to see in our teams and just be real. When I don’t know the answer, I am quick to admit it. And when we fail, the important thing is what we’ve learned, and how that will set us up to succeed the next time. As leaders, we also need to recognize that sometimes we are the problem, and take steps to change it. Earlier this year, I overheard some people on my team share that an idea had gotten “stuck” in a lengthy approval process. As a leadership team, we were the problem — and the roadblock to the very success we were asking for. That day we implemented a new program we call “Fast Pass.” Every Thursday leaders across my organization open their office doors for a two-hour Fast Pass block of time, inviting team members to stop in, pitch ideas, and trouble-shoot. It has created an entirely new dynamic of conversation and insight within our group. One of the great things about being in the food business is that you literally bring goodness through nourishment to the world every day. When we bring chicken with No Antibiotics Ever to market, we aren’t just selling chicken — we are helping moms feel better about their kids’ favorite food. Some of our new Hillshire Snacking party trays are designed to make bringing friends together fun and stress free. Our Jimmy Dean breakfast products are about more than breakfast — they are about creating an optimistic start to your day. This is one of the reasons I love the food business — we’re delivering so much more than just a product. And as a company, we’re focused on building a sustainable food system through initiatives such as our commitment to reduce greenhouse gas emissions 30 percent by 2030, our latest land stewardship pledge, and our continued investment in alternative proteins. By 2050 we will need to feed a population of 9.7 billion people around the world, which is why creating sustainable food at scale is a critical component in bringing goodness to the world. And, it all links back to where I started — my immigrant parents taught me the power of empathy early on by always having an open door to help and bring out the best in others. It was just a way of life growing up — and having this platform with the scale to expand that reach is incredibly meaningful. 1. Purpose is the greatest motivator: I have learned that people are motivated so much more by purpose than just profit. Clearly articulating “why we exist” — in creative ways, multiple times — goes such a long way in bringing out the best in people — and that brings out the best in business. 3. Pressure can be positive: Failure is a part of business, and I’ve learned that mistakes are okay if you are transparent and apply the lessons to drive future results. Humility is the freedom for learning, humility is not the opposite of confidence. The pressure that seems to intensify as you rise can be a motivator. 4. Attitude is everything, and it is OK to fake it when you don’t feel it: I’ve actually quoted Henry Ford to my kids multiple times when he said, “whether you think you can, or you think you can’t, you are right.” Plenty of people have told me that attitude is everything. But no one told me that sometimes you have to force yourself to believe — even if you have to fake it until you feel it. Positive outlooks are a habit, not an accident. 5. When you feel uncertain, you are on the verge of something great: Greatness comes from a leap of faith, not from complete and utter certainty. Because if you are 100% certain, you probably aren’t being very bold. So many options, since my dad used to quote everything from Gandhi to Winston Churchill to Dr. Seuss! I’ll go with one that seems so simple and yet is so brilliant at the same time. “You have brains in your head, you have feet in your shoes, you can steer yourself any direction you choose.” This Dr. Seuss line from “Oh the Places You’ll Go!” is a good reminder that life is more about how we choose to respond and lead, and less about what happens to us. There are so many leaders I’d love to learn from — if I had to choose one right now, I would be thrilled to have breakfast with Melinda Gates. Her work with the Bill & Melinda Gates Foundation has been so incredibly powerful and I’ve followed it for years. More recently, I’m intrigued by the way she has entered the venture capital world by investing in female-led or minority focused firms. I think it would be fascinating to discuss disruptive innovation with her over coffee.